Some days the wind works in your favor, and you can channel your inner 'model workin' it in front of a wind machine' vibe. Other days it turns your hair into a giant shapeless pile of frizz. At least it's Friday, and for many of you, a long weekend! Don't forget you have until the end of today to enter to win a pair of Converse shoes, and until the end of the weekend to win a Mi-Pac Leopard Duffle Bag! We have a busy weekend ahead which includes going to the Circus! Fab look Lydia and I like your hair tossled. :) Have a great weekend. Love that house of harlow, I might need to get the stone one myself now. I only have the leather! TGIF! When it somces to taking outfit photos, the wind is the bane of my existence. My hair is wild to start with and even that slightest breeze just gives it an excuse to behave even worse! 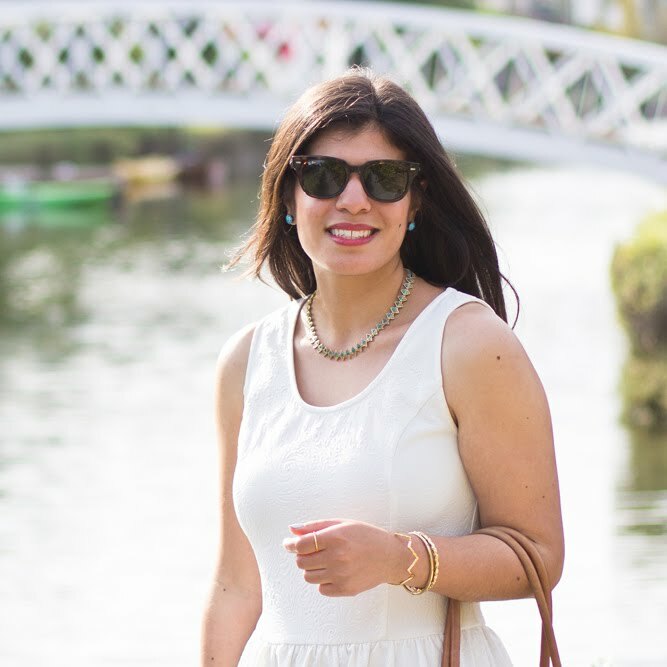 I totally sympathise - in fact, my own blog photos today are quite wind blown. Although, if it helps, I've found that no one notices we look like we're being blown away but us. Everyone else is concentrating on our fabulous outfits. And this one is perfect - I've been contemplating something very similar but I'm missing the right necklace and now I realise why; I need a House of Harlow piece in my life! And sometimes the wind blows your hair right into your lipgloss. sigh. You look fabulous though! I have more problems with humidity than with wind doing a number on my hair! Loving this casual and chic look! Ahh in love with your bag! It's so beautiful and the color is perfect! 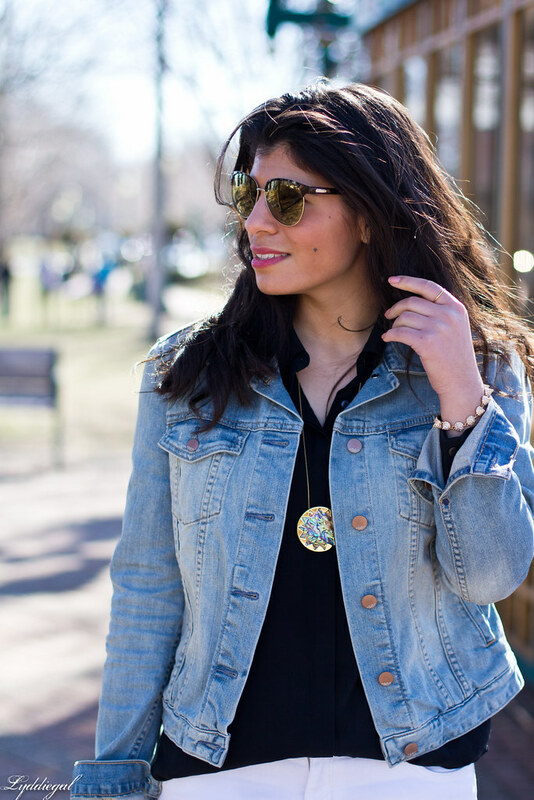 Love this classic look, a denim jacket is always in style. Ahh I hate when it's windy when I'm trying to take blog photos. You look great! I love your necklace and those jeans. I think in your case here, it's definitely making your hair model-esque. Werk it, girl. Work it real good. Aah, I will never not love that necklace of yours! Really cool denim look. Love that necklace and bag. Your hair is fabulous so the wind works for you. Have a Happy Easter, Lydia! Ahh Lydia...that Coach bag! I love it....I want it lolll!!! 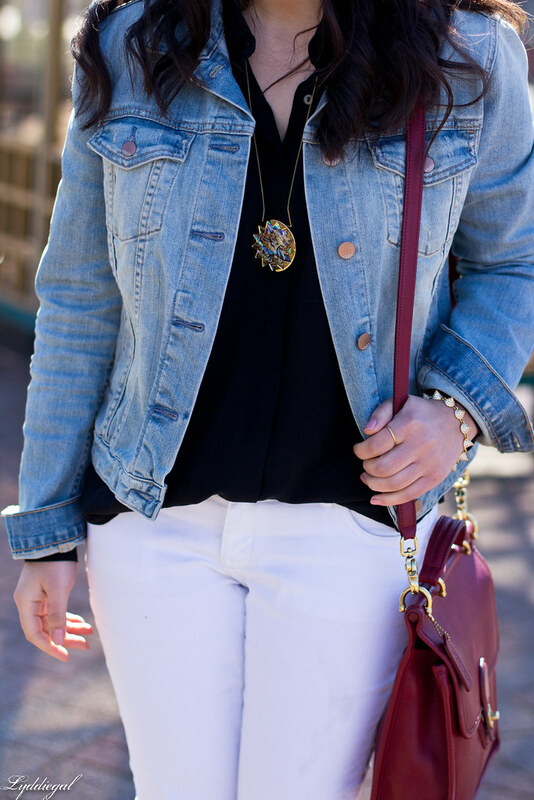 Great denim on denim look! 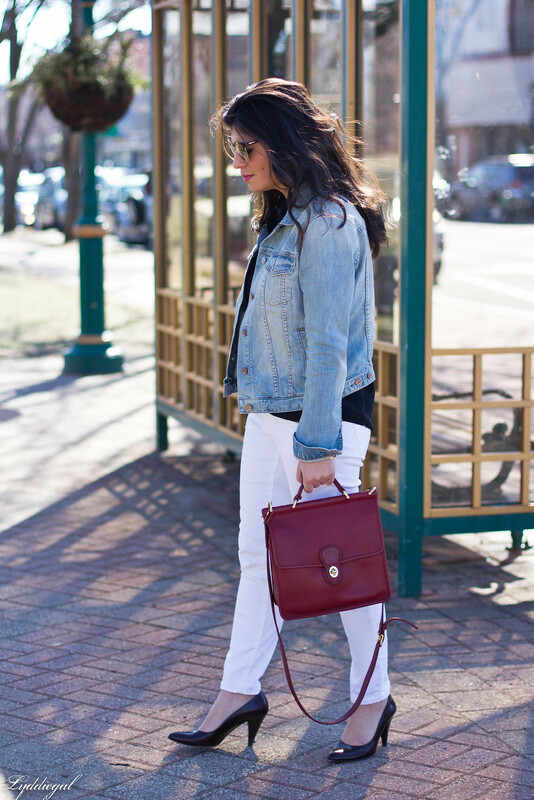 White jeans are Spring/Summer must have! Your outfit is great and I was looking into something very similar. You look great! Love this classic look! I know right! I hate the wind when it comes to pictures ;) it likes to mess with my chi. You look gorgeous as usual. This outfit is perfection. Love the simplicity of it! Those sunnies are SO fab! this outfit is my PERFECTION! Everything fits well, classic colors and pieces with an amazing statement necklace (that I am fully clicking/stalking!). 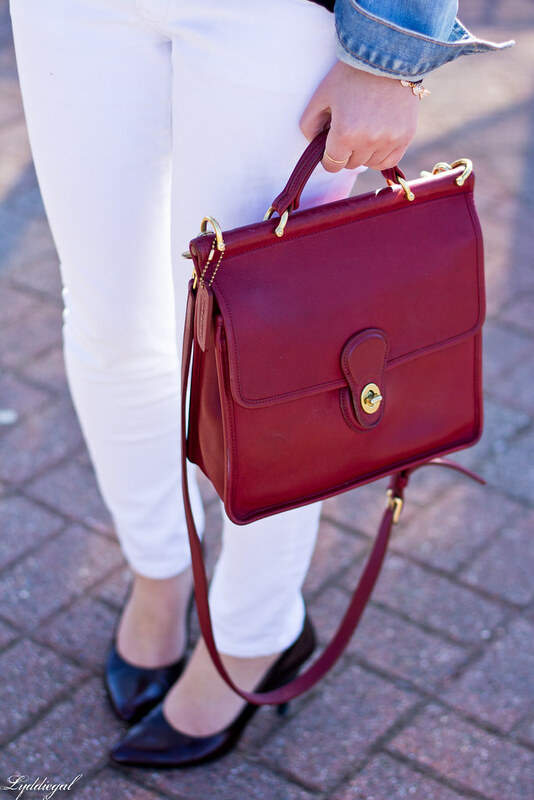 Oh the red Coach bag ... i have serious issues with it, its a favorite. Its been a long time since i'd seen you wear a jean jacket - they're always in style.